Sunflowers display bright yellow colors. 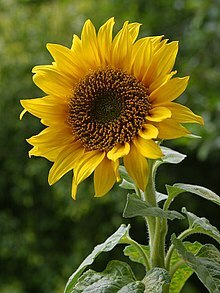 The Heliantheae (sometimes called the sunflower tribe) are the third-largest tribe in the sunflower family (Asteraceae). With some 190 genera and nearly 2500 recognized species, only the tribes Senecioneae and Astereae are larger. The name is derived from the genus Helianthus, which is Greek for sun flower. Most genera and species are found in North America and South America, particularly in Mexico. A few genera are pantropical. Most Heliantheae are herbs or shrubs, but some grow to the size of small trees. Leaves are usually hairy and arranged in opposite pairs. The anthers are usually blackened. The above statements about the size and distribution of the tribe apply to a broad definition of Heliantheae, which was followed throughout the 20th century. Some recent authors break the tribe up into a dozen or so smaller tribes. Commercially important plants in the Heliantheae include sunflower and Jerusalem artichoke. Many garden flowers are also in this group, such as Coreopsis, Cosmos, Echinacea, Rudbeckia, and Zinnia. Some authors place Coreopsis and Cosmos in the Coreopsideae tribe. In addition to the benefits brought by the group, some are also problematic weeds. Species of Ambrosia (ragweed) produce large quantities of pollen. Each plant is reputed to be able to produce about a billion grains of pollen over a season, and the plant is wind-pollinated. The traditional circumscription of the Heliantheae arises from Cassini's 19th-century classification of the Asteraceae. This broad group been divided by some authors into smaller tribes: Bahieae, Chaenactideae, Coreopsideae, Helenieae, Heliantheae sensu stricto, Madieae, Millereae, Perityleae, Polymnieae, and Tageteae. Because the Eupatorieae originated from within the Heliantheae (broadly defined), to maintain monophyletic taxa it is necessary to either make Eupatorieae a subtribe within Heliantheae or to split the Heliantheae into smaller tribes. Such classifications may define a supertribe Helianthodae including these smaller tribes, the Eupatorieae, and a few other tribes such as Inuleae. ^ "187n. Asteraceae tribe Eupatorieae". Flora of North America (Vol. 21 Page 456, 459). Retrieved 2007-10-06. ^ "187. Asteraceae". Flora of North America. Retrieved 2007-12-07. Bremer, Kåre. (1994). Asteraceae: Cladistics & Classification. Portland, OR: Timber Press. ISBN 0-88192-275-7. Robinson, Harold Ernest. (1981). A Revision of the Tribal and Subtribal Limits of the Heliantheae (Asteraceae). Smithsonian Contributions to Botany: 51. Strother, John L. (1991). Taxonomy of Complaya, Elaphandra, Iogeton, Jefea, Wamalchitamia, Wedelia, Zexmenia, and Zyzyxia (Compositae - Heliantheae - Ecliptinae). Systematic Botany Monographs: 33. ISBN 0-912861-33-9. Cassini, Alexandre de (1794–1823). "unknown". Journal de Physique, de Chimie et d'Histoire Naturelle. Paris. 88: 196. J. Phys. Chim. Hist. Nat. Arts. Retrieved 2008-06-30. This page was last edited on 4 September 2018, at 08:15 (UTC).